There’s more to Hamilton Island than resort pools and swanky restaurants. For the ultimate family holiday, check out these top activities for young and old. All yours – sailing the Whitsundays around Hamilton Island (photo: Elise Hassey). The Whitsundays are renowned Australia-wide for being the perfect place to learn to sail, and plenty of people do, thanks to numerous bare-boating charter options. However, if you’re looking for a sailing experience while keeping your feet planted on solid ground (that is, Hamilton) at night, then consider hiring a mini catamaran. Kids and adults can try their hand at sailing these two-hulled catamarans around the safe waters of Catseye Bay. If that sounds too daunting, sign up for a private or group lesson. 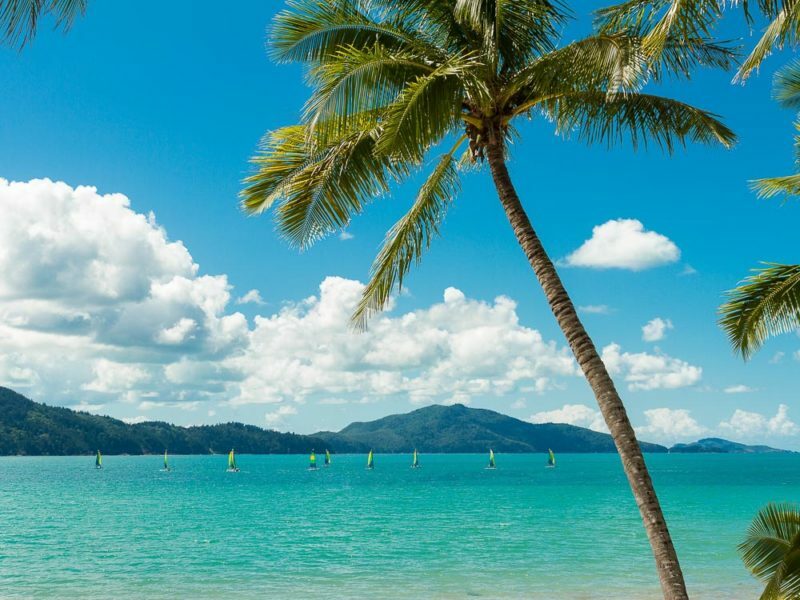 Check in with Hamilton Island Beach Sports on Catseye Beach to find out when the wind and tides are suitable, and ask your hotel staff if it includes complimentary hire. If hiring a catamaran isn’t for you, don’t worry. You don’t have to hoist a sail and learn the ropes to enjoy a day on the water in the Whitsundays. Charter a dinghy from Hamilton Island Tour Desk and take the family on a half- or full-day sightseeing, swimming or fishing excursion. Pack a picnic and go ashore at a hidden cove for a lunch to remember, or jump overboard for family snorkelling fun. If you want to go fishing, you can pick up the basics at Hamilton Island Marina. Parents take note: no boating experience is required. If you’re keen to go fishing but don’t know your squid jigs from your spinnerbaits, sign up for a tour. Renegade Fishing Charters runs half- and full-day excursions from Hamilton Island around the Whitsundays, with all gear included. You can join a shared charter or, if you’re travelling with extended family or friends, book a private charter (children must be aged 6–14 years). Expect to reel in coral trout, snapper and cod, among other species. Once you return to the marina you can organise to have a Hamilton Island chef cook your catch for dinner. Not bad for a hard day at sea. It’s the star attraction of the Whitsundays and the subject of thousands of Instagram snaps, but what we love about Whitehaven Beach is how kid-friendly it is. The aqua water meanders away from the white-sand shore, creating a shallow and safe play area for babies and small children. 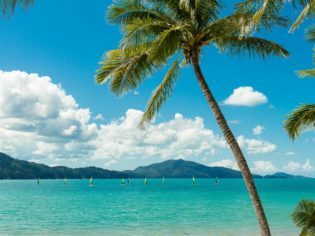 To get there from Hamilton, you can join a Cruise Whitsundays’ tour, which calls into the island after departing Airlie Beach, the main town servicing the region. Or, you can join Explore’s Sail & Snorkel Whitehaven and Chalkies Beach full-day excursion (minimum age is five). Running daily (from April) between 8.30am and 4pm, you’ll get to cruise around the Whitsundays, swim at Whitehaven, enjoy an on-board buffet lunch and snorkel at Chalkies (keep your eyes peeled for turtles). Snorkelling gear, stinger suits and life vests are provided. If snorkelling at Chalkies whets your appetite for more underwater adventure, Explore also offers a half-day Snorkel & Dive Whitsunday Islands tour. Departing from Hamilton Island, you’ll be taken to the best snorkel sites to spend two hours swimming around the region’s coral reefs. The tours operate frequently, however certified diving is only available on Mondays and Fridays. The minimum age for snorkelling is five, while divers need to be 14 years or older. Put the paleo bars away for an afternoon and shout the kids, and yourself, a treat from the Ice Cream Parlour down at Marina Village. Go all out and order a sundae or double chocolate-coated waffle cone. If you prefer gelato, there are 12 flavours to pick from at Pizzeria and Gelato Bar across the way. While you’re there, why not grab a slab of pepperoni pizza for dinner, too? There are plenty of pools to enjoy on Hamilton Island, including the popular 35-metre pool at Reef View Hotel. However, if you’re craving a little sand and salt, you’ll want to head to Catseye Beach. Go for a swim or hire a stand-up paddleboard, catamaran, windsurfer or kayak from Hamilton Island Beach Sports. You can also pick up snorkelling gear here, or join a guided snorkelling tour. Who knew quad biking or go karting was a thing on Hamilton Island? For a tropical adventure that’s bound to get your little ones’ hearts racing, make time for a session or two of Quads for Kids. Children aged between six and 14 can zoom around a quad-bike circuit for 15 minutes. They’ll get a safety briefing beforehand and be guided by experienced instructors, so there’s no need to worry. The tour times change depending on the season, so ask your hotel information desk when checking in. Riders will need long pants and closed shoes, so don’t forget to pack them. If they’re smiling from ear to ear after that experience, take the kids along to the go-kart track and ride with them. The quad biking and go-karting are located at Palm Valley Activities and there are age and height restrictions, so call ahead. Keep the adrenaline pumping on a jet-ski tour around the Whitsundays. This is a great family activity, as Mum or Dad can be the main rider, with a child above the age of 12 as a passenger. An instructor will show you the ropes before taking you to some of Hamilton Island’s secret spots and to outer channels. Aside from the fun factor, the tour is a great way to learn about the aquatic environment and you may be lucky enough to spot turtles and whales. The hour-long tours run daily (weather dependent) and depart from the marina. Teenagers will love thrashing around the waters off Hamilton on a jet-boat. The HI Watersports Jetryder Tour is 30 minutes of high-speed action during which you’re bound to get soaked. Mini wild ones will have to wait until they’re older for this tour, with children needing to be at least 1.2 metres tall. There is also a maximum age restriction of 65 years. The tours run regularly from Marina Village and life jackets are provided. If you’re visiting during the tropical summer (January to March) and get caught in a downpour, or you’re craving time out of the sun, head along to Island Bowling. Open from 1.30pm until 9pm daily, you can test out your skills at nine-pin bowling (yes nine, not 10) at Hamilton Island Resort Centre, next to Beach Club hotel. Turn up the fun factor by playing at night when the lanes, pins and balls glow in the dark. Ask for the bumpers and ramps if you have young children. For outdoor fun that doesn’t involve swimmers and sand, enjoy a round of mini golf near the Sports Club. If you loved night-time bowling then you’ll want to try glow-in-the-dark putt putt, too. It’s on between 6pm–8pm, while daytime hours tee off at 6am. Create long-lasting moments for your kids by signing them up for a cuddly koala photo op at WILD LIFE Hamilton Island. Situated not far from the major resorts, this island animal park is open daily and also includes a breakfast with koalas. If you prefer your animal meet-and-greets not so cute and fluffy, put your hand up for a dingo, snake or bird photo encounter instead. The park is also home to kangaroos and a crocodile, and you can learn about them on guided tours.